Tell us about the PECAN project and what it is that you're studying? The Plains Elevated Convection at Night (PECAN) campaign is designed to increase the understanding of severe thunderstorms at night over the continental United States and involves eight research laboratories and 14 universities, both national and international. PECAN will be conducted across northern Oklahoma, central Kansas and into south-central Nebraska from 1 June to 15 July 2015, and is funded by the National Science Foundation (NSF), the National Oceanic and Atmospheric Administration (NOAA), the National Aeronautics and Space Administration (NASA) and the Department of Energy (DOE). PECAN will focus on nighttime convection in conditions with strong low-level winds and a stable layer near the surface with the largest instability located aloft. The findings should be applicable to other continental regions with strong nighttime thunderstorms. To improve prediction of nocturnal convection that will be useful to improving both the operational forecasting and in climate models. 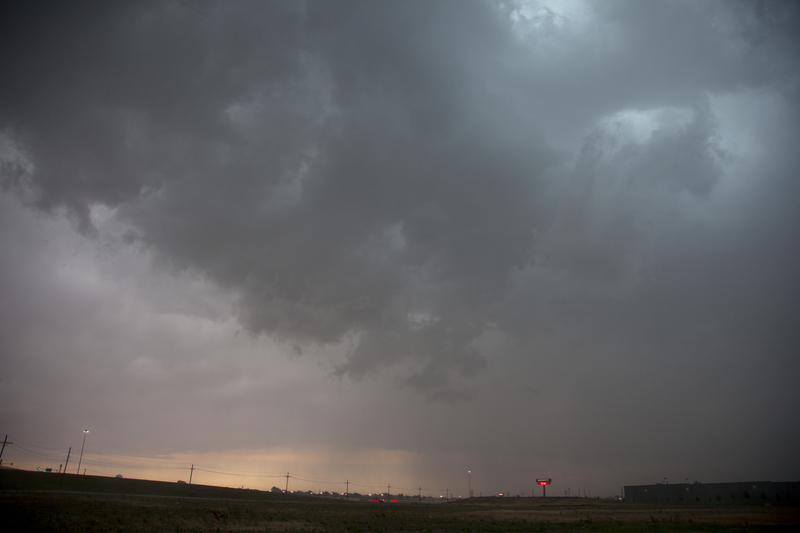 Why is important to know more about severe nocturnal convection? in overheard. Photograph by Carlye Calvin. PECAN is driven in large part by poor prediction of these large-scale, severe and hazardous thunderstorms, known as Mesoscale Convective Systems (MCSs) that often occur at night. There is considerable gap in our knowledge about the dynamical mechanisms that initiate, organize and maintain this convection. These storms have significant impact on the region's hydrology, energy, agriculture, and public safety. PECAN research will positively influence the nation’s forecasting and weather prediction capabilities through collaborative efforts between researchers and NOAA’s National Severe Storms Laboratory. The effort is highly relevant to National Weather Service's goal to assess the increasing dependence of storm-scale prediction on numerical modeling, as in the Warn on Forecast Initiative. This initiative has a goal to increase the lead-time of accurate tornado, severe thunderstorm and flash flood warnings to reduce the loss of life, injury and damage to the economy. Nocturnal convection, in particular, endangers public safety as significant flash floods in the eastern 2/3 of the U.S. usually occur at night. The data from this project will also assist in developing and applying space-based remote sensing, weather prediction and climate modeling. While PECAN will initially focus on observational analyses, idealized modeling and high-resolution simulations, we are confident that the advances in knowledge about the initiation, organization, maintenance and evolution will benefit both weather forecast models and climate models. Infrared animation (GOES-13 10.7 microns) of Severe Convection over Nebraska on June 3 2014. Animation courtesy of CIMSS Satellite Blog. Nocturnal convection is nighttime thunderstorms. The prediction skill for nocturnal convective storms is lacking. Not only is it difficult to forecast the location and timing of nighttime storm formation, but it is also difficult to forecast the evolution of the storms into mesoscale convective system (MCS). An MCS is a series or cluster of thunderstorms that organize into a large-scale system that typically persists for several hours or more. MCSs may become severe and can produce injuries or fatalities through torrential rains and flash floods, high winds, hail, intense electrical storms and even tornadoes. Where else in the world do severe nocturnal convection event occur besides the continental United States? 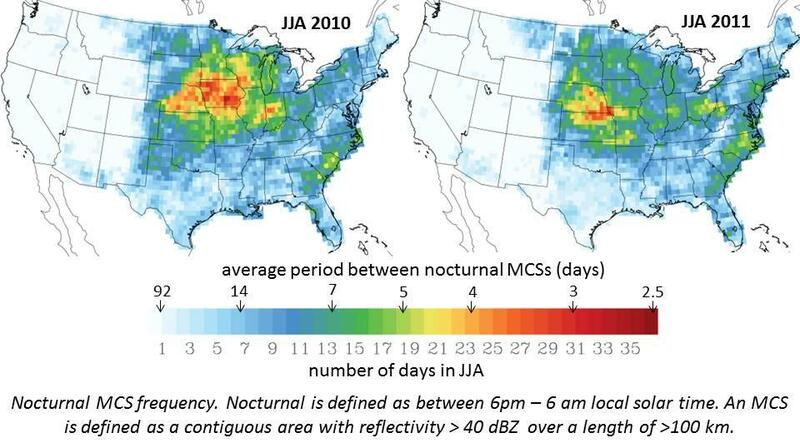 Frequency of nocturnal MCSs on a 0.5°x0.5° grid in June, July, & August 2010 and 2011, based on the WSR-88D national composites. Analysis courtesy of James Pinto - NCAR. Click to enlarge. While the study is aimed at the Great Plains of the U.S., the long-term implications of PECAN are that the findings will have important relevance for other regions with similarities in the behavior of convection. Relevant regions include southern Canada, the Sahel/Savanna belt of northern Africa, Asia, Africa, Europe, S. America and Australia. Efforts will be made to draw international attention to PECAN findings through conference presentations, publications and through PI memberships on international committees. What kind of platforms and instruments will you use to make your observation and collect data? campaign. Image by Alison Rockwell NCAR/EOL. The PECAN campaign calls for a wide range of over 100 platforms and instruments to profile the atmosphere and make detailed observations of temperature, pressure, humidity, and wind speed and direction. 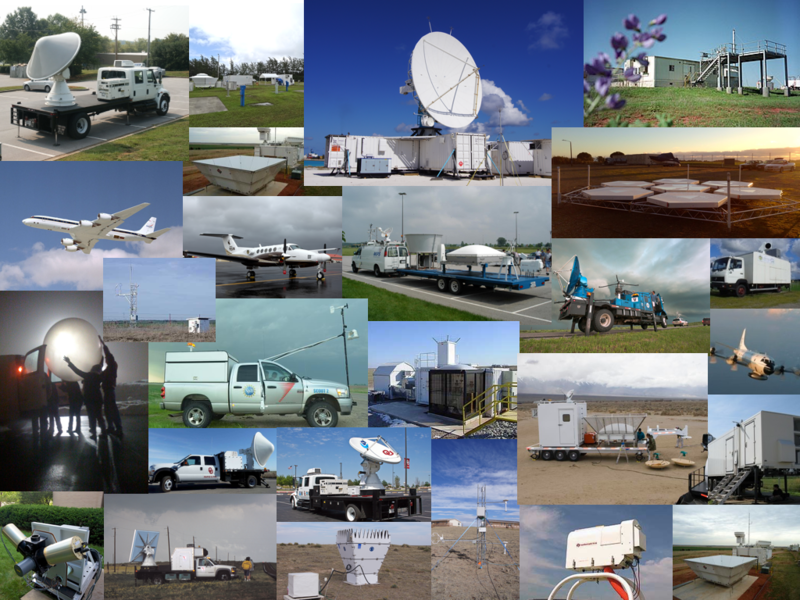 A unique aspect of the experimental design is the integration of a wide variety of profiling systems into a fixed and mobile PECAN Integrated Sounding Array (PISA) including water vapor Differential Absorption Lidars (DIAL), Doppler lidars, Raman water vapor lidars, multi-channel microwave radiometers, infrared spectrometers, and acoustic systems. Each PISA will be highly complementary in their capability to profile wind, temperature, water vapor, and aerosols. 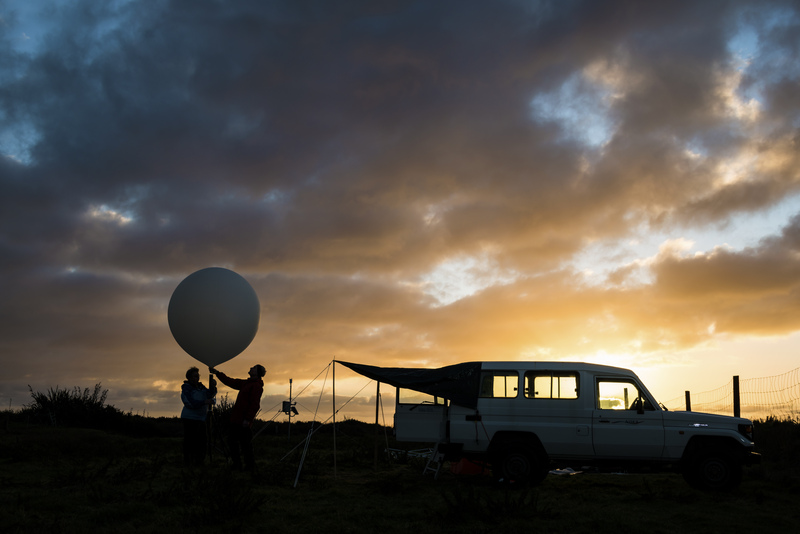 PECAN will deploy balloon-borne radiosonde soundings at discrete locations to complement others from the National Weather Service and Department of Energy sites. Fixed PISAs (FP): Six ground-based sites will house fixed instrumentation in Kansas and Nebraska during the project. Mobile PISAs (MP): A fleet of mobile facilities will be dispersed in the region targeting specific weather objectives each day. In addition to the Mobile PISAs, a fleet of mobile C-band and X-band Doppler radar trucks will be deployed in the region to specific weather targets and events based on the daily research objectives. The NEXRAD radar network will be used in conjunction with the NSF/NCAR 10-cm polarimetric radar, S-PolKa, which will be used for supplementing the NEXRAD network and for its vertical scanning capabilities. Three research aircraft will also be deployed to make higher altitude observations, including the NSF/University of Wyoming King Air, the NASA DC-8 that will probe the pre-convective environment, and the NOAA P-3 that will observe the dynamical and microphysical characteristics of MCSs. Are you only collecting data at night? How will that affect all of the project staff involved?!? Much of the fixed instrumentation of PECAN can operate autonomously and will therefore be collecting data continuously day and night. The mobile instrumentation requires experienced personnel and will be operated only during PECAN nighttime deployments. Safety is a big concern and many efforts have been put into planning for the safety of all personnel. The mobile crews will be based in Hays, KS but will depart Hays late afternoon in time to reach their intended location well before sunset. They will set up their instruments and begin collecting data in the daytime hours. They will stay in position collecting data while the thunderstorms form or move over the instruments. After the storms have passed for the evening, they will return to Hays or to a nearby hotel if it is too late to safely return to Hays. The project coordinators will closely monitor staff and insure that fatigue is not affecting the staff. With ~25 nights of operations within the 45 day PECAN period, there will be nights off for the staff to rest and recover.